McEs, A Hacker Life: Happy! Happy! Happy! Happy! Happy GNOME 2.14, released to the date on 15th of March 2006. Happy St. Patrick's Day, on 17th of March 2006. 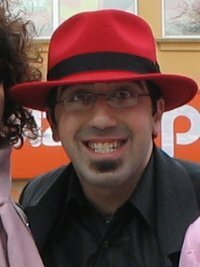 Happy Fedora Core 5, released on rescheduled date on 20th of March 2006. Happy Norouz, the Iranian New Year, as scheduled on 20th of March 2006 this year. We had a little party on Friday night, covering all the events above. I started by going to the Iranian neighbourhood of Finch & Yonge for some Norouz shopping, then started cooking Persian food and cheering up with Farhang and Siamak. They left around 7pm to get to other Iranian parties in town. At that time the GNOME/RedHat friends started arriving, which were Ben (GOK), Tom (Java Gnome), and John (inotify, gnome-vfs). Zishad and Alireza joined us too. John also brought a bottle of Shiraz the Little Penguin (which has got a red label), with a little penguin on it. We talked about GNOME, including the bugzilla point system, (hopefully) enjoyed the Gheyme beef stew dinner, and the Little Penguin. Next, around 11ish, Alireza left and we found a taxi to let the five of us in and we got out in front of the Duke of Argyle in John St. We had to wait twenty minutes in the cold to get it, but John had some drinks to warm us up in the street. There we had pints of Guinness and car bomb, until past the last call at 1am. So another taxi and we were in a pub in Bloor St., I don't remember the name (or the place either, that's when my memory started fading for the night.) I had a Green Beer, and we came back home for more chit-chat. The party ended around 3ish I am told. Finally, Hossein and a friend of him arrived at around 4am, coming back from the huge Iranian party and not going back to Hamilton and that hour. So we finished the evening making sure the bottles are emptied properly, and I found myself sleeping on the couch all dressed up with a bad headache in the afternoon... Fortunaly we had lots of left-over food from last night to eat. As a little new year present to my Iranian friends, I worked over the weekend on moving The RiRa Persian Digital Library to SourceForge from it's previous host in Iran. Lots of nice features added as it's based on an improved code-base I've been working on for a while. I had to migrate from PostgreSQL to MySQL, which was a bit painful as I use views heavily, but I short-circuited by saving the views as static tables and import that in MySQL. Not perfect, but works for a digital library. Getting the Lucene 1.2 based search to work on sf.net was far easier. Uploaded the class files and installed a Sun JRE and voila, it works great! I never enjoyed Java this much ;-). Make sure you subscribe to the RiRa-announce mailing list to get updates. Enjoy! Update: 25000 pages hit for RiRa on the first day! rira says: google, google, index me! Migrating from Pg to My? That's a step in the wrong direction. Why did you do that? Because sf.net only provides MySQL for web service they provide. and the conclusion of the points system was...? Somebody was asking for a page to list top point holders. Somebody else (won't name him!) told us how he first adds a comment that "I'm going to close this bug." and then closes it, to get one more comment credit :-D.
And the non-GNOMEie among us asked what are these points good for? And we didn't know :-D.
We have a RFE to make a report of the top # of points holders.. In that bugreport Elijah listed the top ones of 1-2 months ago. The intention of the points is to easily see how much experience someone has with (gnome) Bugzilla. Someone with >15 you can usually trust more than a lowly points user (meaning: could be a dupe, how closely to check for errors, etc). Very handy for new triagers or when triaging a product you do not know. It is pretty simple indication but helps a lot when triaging loads of bugs. Getting more people to triage is another 'goal' (but not advertised to prevent people from making stupid changes). They are all valid arguments indeed, and that's why I'm loving the point system :D.
Why did you move RiRa to this new host? it takes like a million years to open a page. So damn slow. Yes, unfortunately it's really slow and sometimes doesn't respond. I assumed that sf.net is going to be far faster than the server in Iran, but apparently I was wrong. Anyway, I had to move, as the owner of the host in Iran was not willing to sponsor it anymore. I'm seeking sponsorship again and will move it to a dedicated server as soon as I find one.